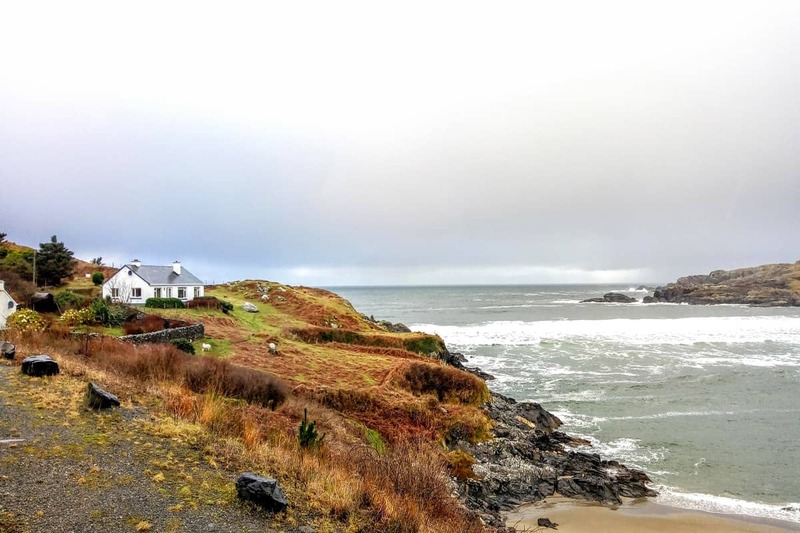 It takes a hardy soul to live on the coastline of Glencolmcille in Ireland’s Donegal County. A rough, rugged landscape this, windswept and stunningly beautiful area studded with the remains of monastic huts, high cliffs and that golden glow when the sun shines is irresistible. Glencolmcille is such a remote location that it suffered tremendously from the famine and the resulting mass emigration over the next 100 years all but made a ghost town of the place. In the 1950’s however, it became a beacon of hope for other emigration-drained areas of Ireland. This tiny community managed to come back from the brink and create a community that valued both innovation and its traditions. The spectacular land and seascape of Glencolmcille draws visitors to the area. A haven of peace and quiet, dramatic glens and cliffs and the roar of the sea crashing on the shores Glencolmcille has something for everyone. The light changes every second creating photographic opportunities and exploring the area brings with it some physical challenges such as the nearly 200 steps down to Trá Bán, or Silver Strand beach. Glencolmcille is named after Saint Colm Cille or Columba, The name Glencolmcille (Gleann Cholm Cille) translates into English as the Valley of Com Cille. Saint Colm Cille, or Columba, is one of Ireland’s three patron saints (along with Saint Patrick and Saint Brigid). Colm Cille and his followers lived in the valley for a time and the ruins of several of their churches can still be seen there. Every June 9th the local folk and some pilgrims go through the 15 Stations, Turas, or journey. This is a religious process that includes 15 different stations or stáisiúin that are within 9 different town lands. The stations are more than likely pre-Christian and they are all stone monuments. 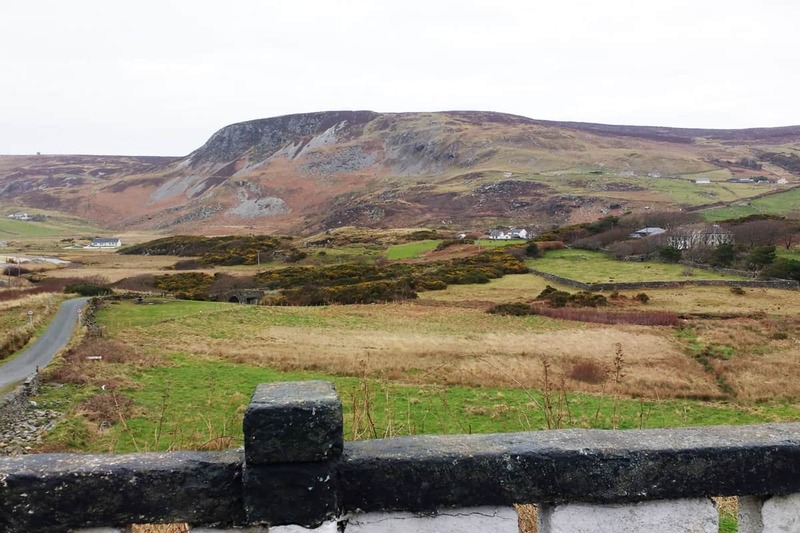 The Turas is a 5 and a half kilometre walk through the hills and valleys of Glencolmcille. 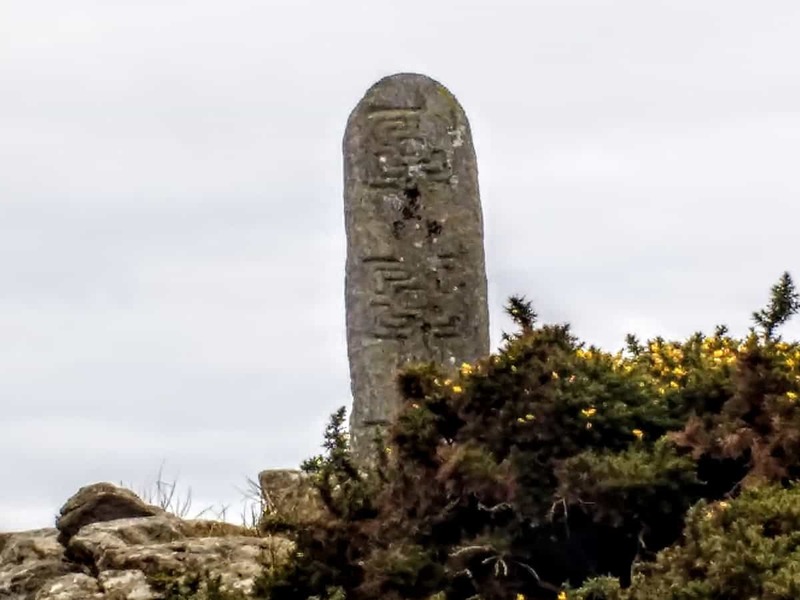 The Turas began over 1000 years ago but went into decline once the outside world began to intrude upon this remote corner of Ireland. 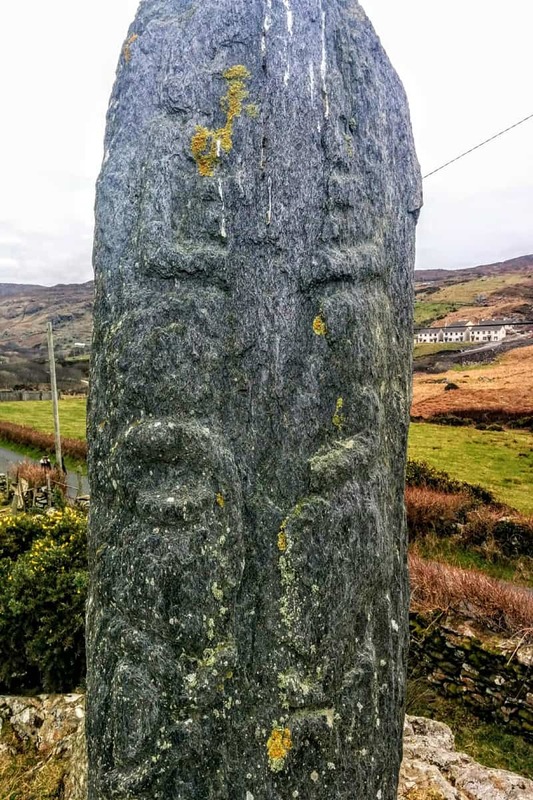 When the community began the journey to re-evaluating its culture and traditions by embracing its Celtic past the Turas became popular again and even the Church joined back in. The journey begins at the court tomb, which was built in 3000 BC. For pilgrims it is both a physical challenge to walk barefoot and in the dark as the Turas begins just after midnight on June 9th. The walk is around 4 hours trekking through rocky hillsides and damp bogs. Repeating the traditional devotions is supposed to bring you closer to salvation. The reason for the after midnight start. This is when it is believed that Saint Glencolmcille took his last breath. 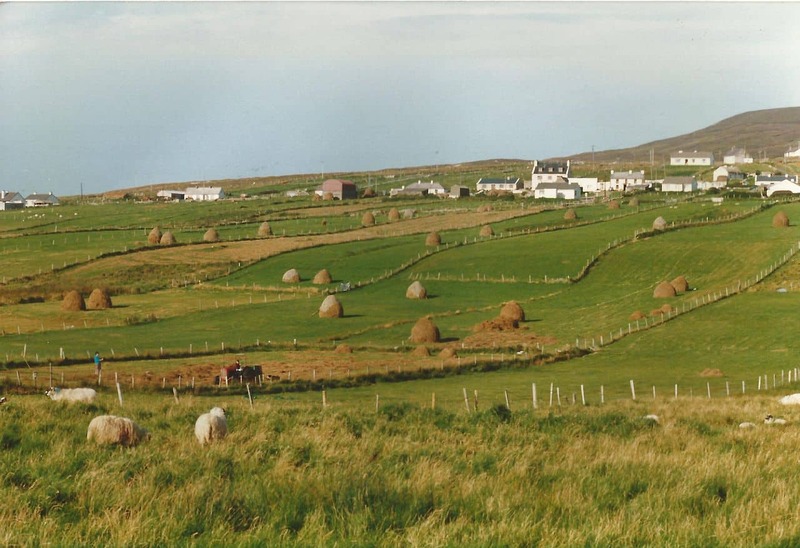 Archaeologists believe that there may have been an early Christian monastery in the Glencolmcille valley. The thought is that it was centered in the same location as the Church of Ireland building. Apparently, there is some evidence there of a large circular enclosure and the Souterrain discovered there is a feature of early monastic sites. The Church itself sits astride the ruins of a prehistoric Court Tomb, which may have been destroyed by the early monastery builders. At nearby Malin Mor, the restored Cloghanmore Court Tomb may be visited. 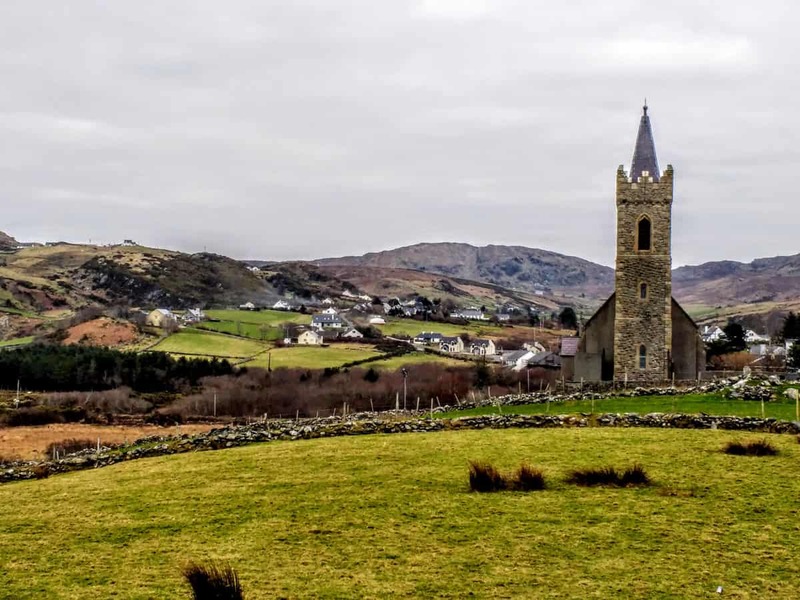 These days in Glencolmcille, the turas is usually led by the parish priest, and many tourists and pilgrims come to take part in the holy journey. 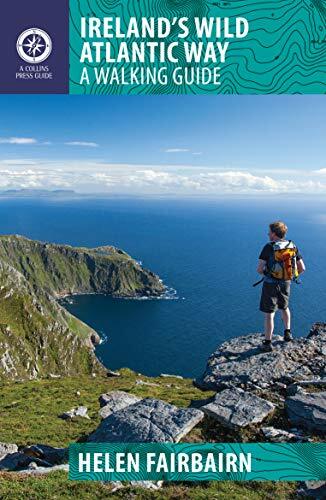 Ireland is an absolute paradise for walkers and the best book for finding those walking trails in Ireland is Ireland’s Wild Atlantic Way Walking Guides. Silver Strand beach is a horseshoe shaped bay that can only be accessed by a very steep staircase with over 150 steps down to the beach. 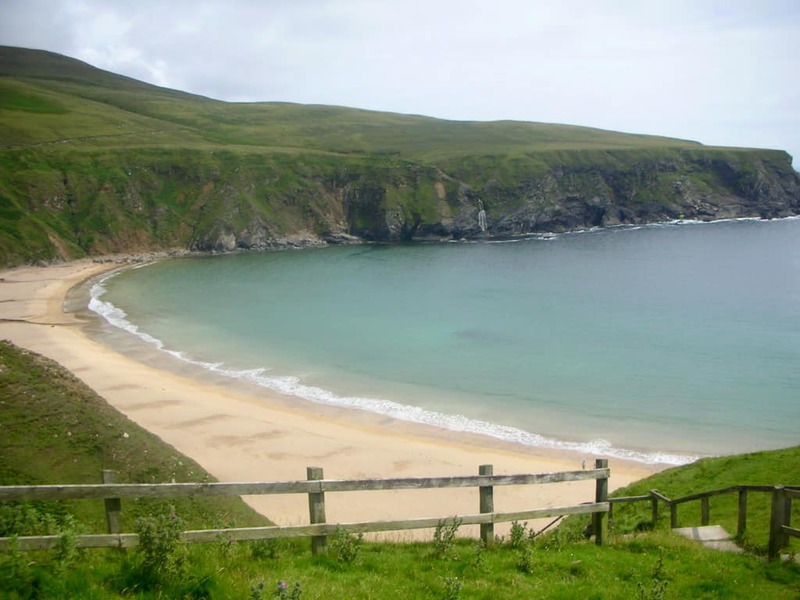 The beach sits between the villages of Kilcar (this is where Sarah Jessica Parker and her hubs Matthew Broderick hang out) and Glencolmcille. This lovely beach is a true hidden diamond, which marks the end point of a long hike from Slieve League’s sea cliffs. The beach stretches out before you in a long curve of pinky beige sand that glitters in the sunlight. The waves gently crash on the shore and it is the perfect place for a swim and a picnic. This is of course if you can manage the stairs up and down. 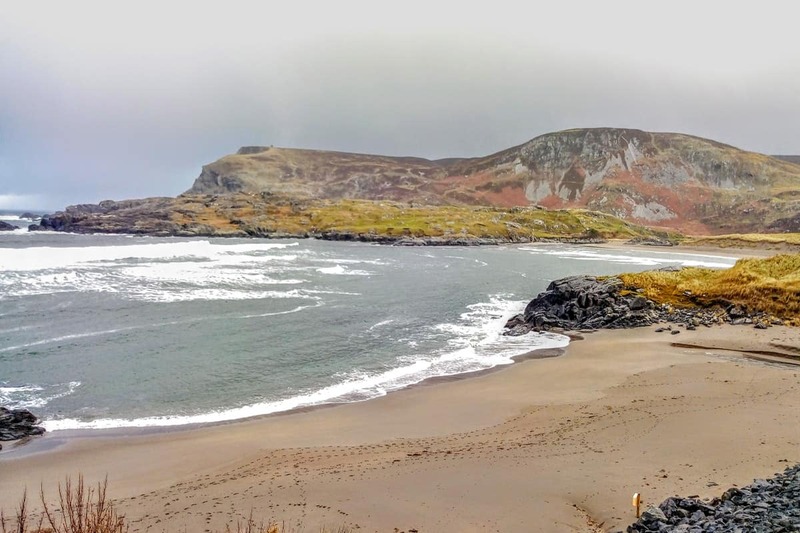 Glen Bay is a small inlet off the North Atlantic Ocean situated between Gaveross Point and Rossan Point approximately 1.5 miles northeast of Malin More Head. A great beach for the family the walk down is a gentle slope and the bay is fairly protected from the high winds and small waves. 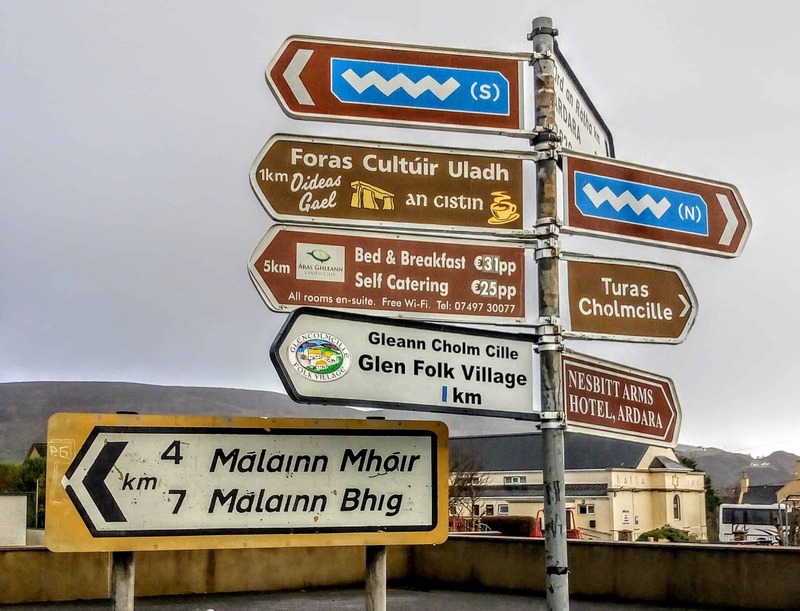 Glencolmcille sits at the centre of one of Ireland’s largest Gaeltacht areas and the district is home to Oideas Gael, an Irish-language learning institute established in 1984 to promote the Irish language and culture. To provide for adult Irish language learners, enabling them to learn enjoyably and efficiently. To participate in the daily life of the Gaeltacht. To promote the Irish language and its literature. To promote relationships between people of Gaelic background and interests worldwide. To promote relations between Gaeltacht people and the rest of Ireland through the language. Not only does the Oideas Gael include classes to learn Gaelic for every level of speaker but they are a cultural feast of activities from traditional crafts such as weaving, Irish music, Hill Walking, painting, writing, photography and archaeology. Glencolmcille is obviously not a large city but it does have two pubs that often feature traditional Irish fiddle music, a grocer, post office, woolen mill, and a great tourist centre where you can discover more information and find accommodations, a restaurant and cafe and the well known Glencolmcille Folk Village. 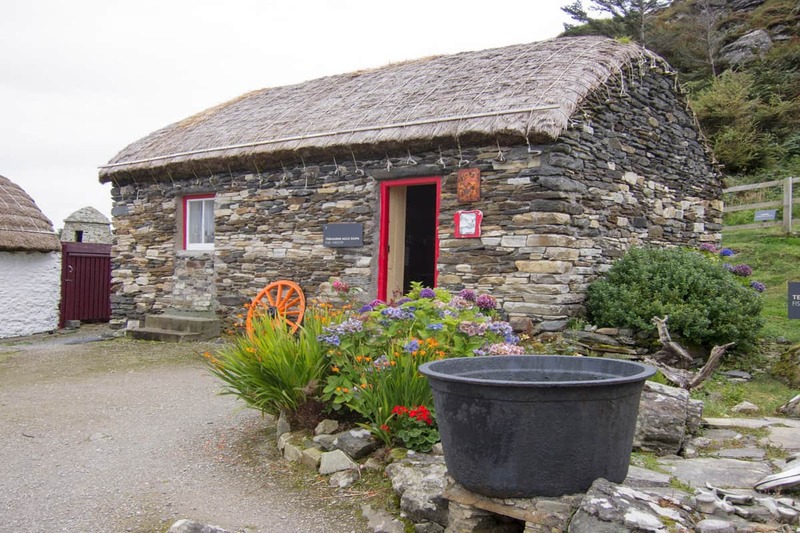 This charming replica of a rural village in Ireland contains a grouping of small thatched houses called a “Clachan”. The village offers a glimpse into the daily lives of the Irish during the past centuries. 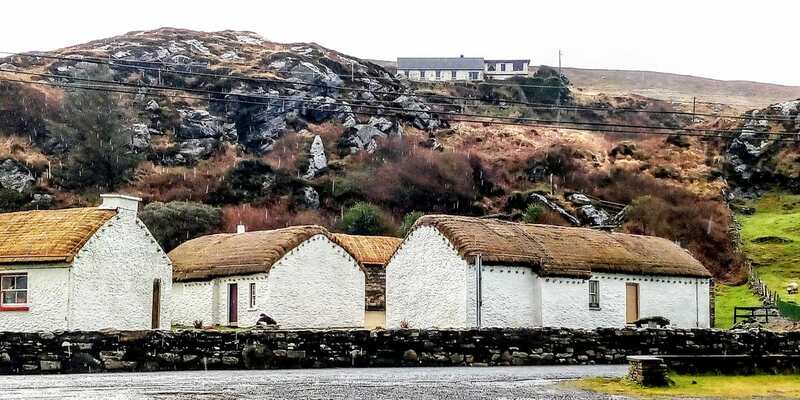 The Glencolmcille Folk Village Museum is perched on a hillside overlooking the other beach in Glencolmcille that you must visit Glen Bay Beach. The Folk Village Museum was the brainchild of Donegal priest, Father James McDyer. He conceived of the idea to help bring visitors to the area, create employment and stem the tide of emigration. The Village opened in 1967 with three cottages and has grown greatly since then. Every cottage is an exact replica of one used by the local people in each century from the 18th to the 20th. The cottages are fully kitted out with utensils, artifacts and furniture from the period. There is a schoolhouse, a little pub/grocery shop and a fisherman’s cottage. The village can be wandered at will or take one of the great guided tours. You can learn a lot about local traditions and practices from the tour guides and watch demonstrations of the old crafts like weaving, cooking and much more. There is a fabulous Craft Shop and tearoom within the Village and a series of workshops you can take on traditional music, Irish culture, weaving and learning tapestry. The Folk Village is open from Easter until the end of October. **End of October, ring in advance to clarify exact date of closure. 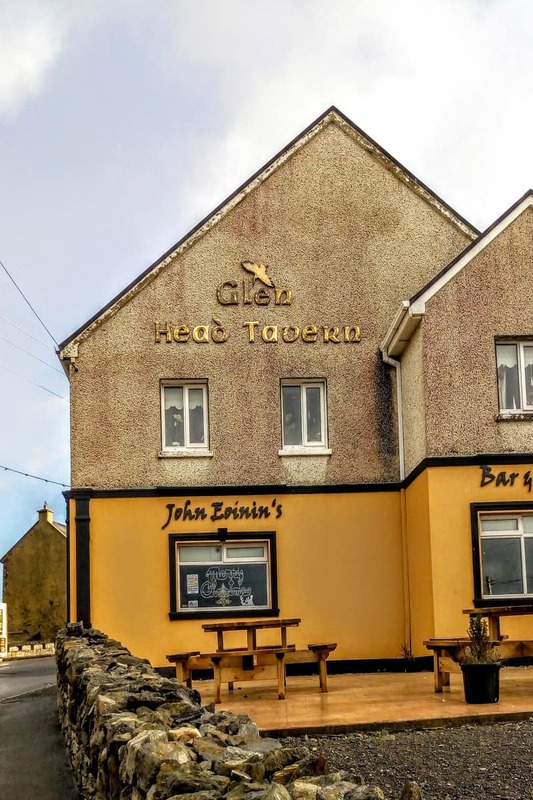 There is a parking lot right across the road from the village and it is here that you will find the iconic Map of Ireland made out of the stones found throughout the country. During the first week of August every year, Fiddlers Week is held in Glencolmcille. Cairdeas na bhFidiléirí works to promote and teach Donegal style fiddling. There may be only two pubs in Glencolmcille but they literally burst at the seams with fiddlers and their appreciative audiences. There is some mighty fine hiking to be done in Glencolmcille. From the two gorgeous beaches and a 5 mile walk to Malin Beg. Who knows what you might find on the beach, the area was home to many a smuggler you know. 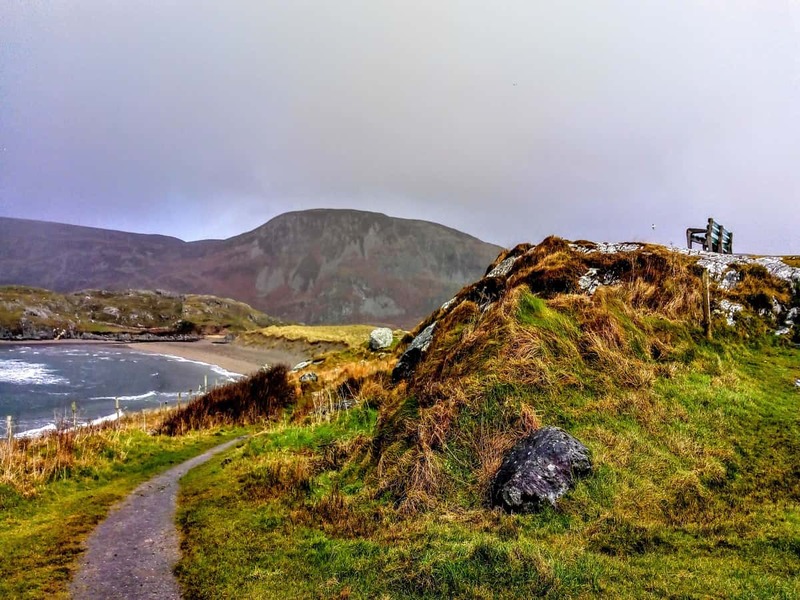 An hour’s walk from the village to Glen Head, which you can see from the folk village due to the Martello tower at its peak, is about an hour’s walk. The Glen Loop walk goes up to the Martello Watch Tower and you can walk along the cliffs to the deserted village of Port. Port’s location beside a stony beach is a picture of solitude. Wave’s crash on the beach and the birds cry overhead, here you feel all alone in the world. Behind Port is the deserted fishing village of Glenlough. If you would like some company on the walk check out some of the local walks with the Sliabh League Hillwalkers. Near Glencolmcille, the harbour of Malinbeg is and a great place for diving, and is perfectly suited for training dives. Malinbeg harbour is within a south facing inlet, which provides good protection against potential bad weather. You can check out the diving possibilities with DivinDec Scuba School. 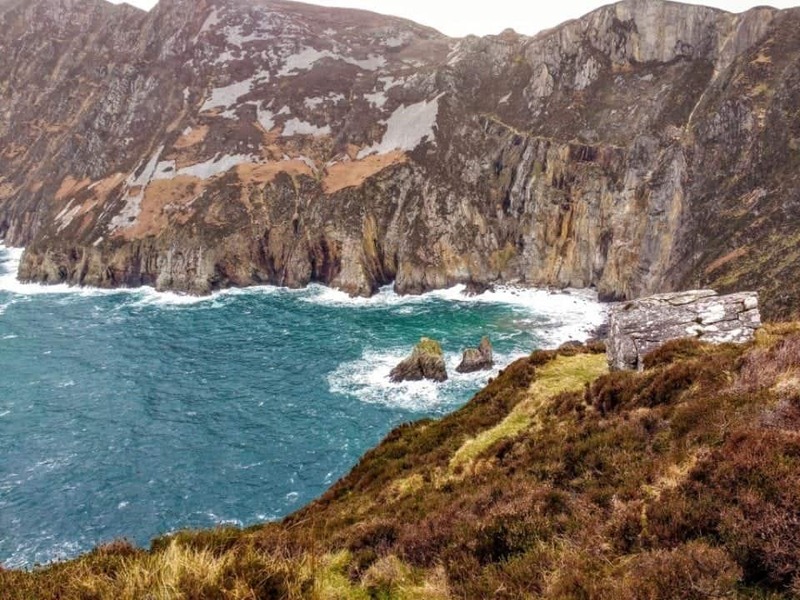 The most outstanding and highest sea cliffs in Europe are to be found at Slieve League. These cliffs outdo the grandeur of the Cliffs of Moher and are much more impressive not to mention threex higher than Moher. To access the cliffs is a twenty-minute drive from Glencolmcille and there is a large parking lot at the base of the Cliffs. There are shuttle buses up to the viewpoints at the walk is around 3 kilometres. You can also drive up to the viewpoint depending on the time of year. 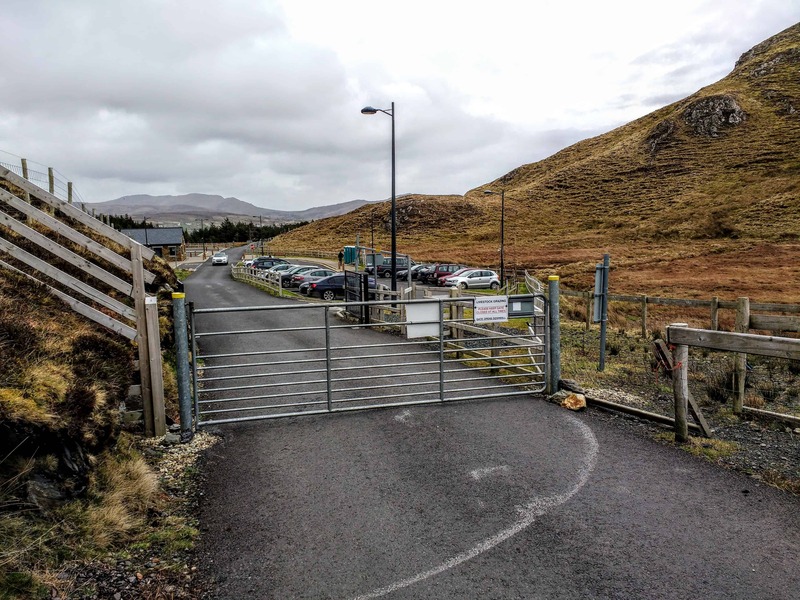 Just open the sheep gate and make sure to close it behind you and drive up to the small parking area near the top. There is no fee to visit Slieve League but there may be soon when the new visitors centre opens. Before you come to the cliffs themselves, you’ll come across the Slieve League Cliffs Centre. Inside, the centre is packed full of local history and culture. The craft shop stocks locally made knitwear and artworks and, come summertime, you can even catch a traditional Irish music session. The walk up to the viewpoints is long and uphill but you will see a Signal Tower at Carrigan Head, which was built in the 19th century to watch for a French Invasion. Close to the viewing area itself, you can see stones, which used to mark out the word EIRE as a marker for the planes of WWII. On a clear day the views from the top of Slieve League is breathtaking. You can see right across to Sligo and Leitrim and all the way to the Mountains of Mayo. If you are feeling very brave and you are an extremely experienced hill walker take the One Man’s Pass, which loops around onto the Pilgrim Path to experience views, and scenery that very few get to see. This path is pretty treacherous and scary to the inexperienced so don’t try if you can’t deal with heights and winds. Boat trips around the base of the Slieve League cliffs are an incredible way to see the beauty of the area. There are dive charters, whale watching tours, bird watching and dolphin spotting. You can also go deep sea angling and catch your dinner. There is a good selection of places to stay either in Glencolmcille or within easy range of the Village. You can find everything here from hostels to pub rooms and you can check with the Tourist office to find a place to stay. Better yet take a look at Booking.com for the Donegal area, you will find a great selection of locations and you can specifically look for areas such as Glencolmcille. Dooey Hostel is located about one mile from Cashel village, with arguably the best views in the country! Find out more about Dooey Hostel. The hostel also has a camping site for those who prefer it. 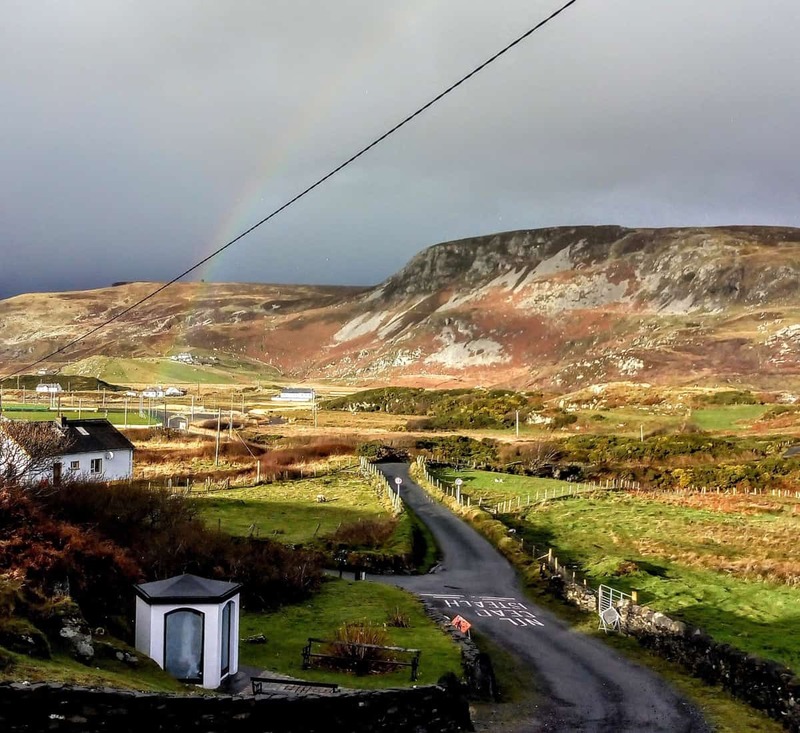 Malinbeg Hostel or Brú na Málainne Bige faces the Atlantic Ocean and Rathlin O’Byrne Island, and offers spectacular views of the rugged Donegal landscape. Ionad Siul Guesthouse, is within walking distance of pretty much everything in Glencolmcille and you can choose self-catering or B&B. The rooms are all en-suite with a communal lounge area. Áras Ghleann Cholm Cille is the activity centre with accommodation. They have private en-suite rooms with TV, WiFi and tea making facilities. There is a large and comfortable common area, plus modern self-catering kitchen. Áras GCC also operates a free 24-hour shuttle service to/from the local pubs, restaurants and bus station. This complimentary service also covers Slieve League and Oideas Gael. 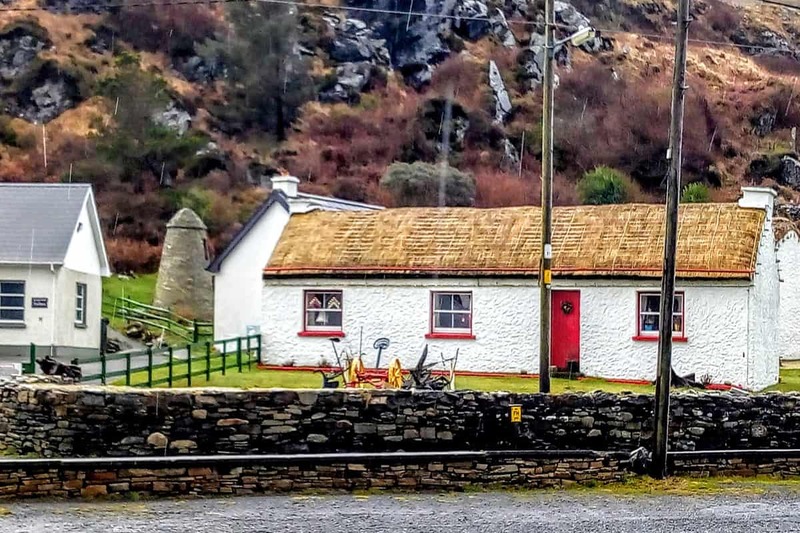 There is also Maggie’s Cottage, is a traditional Irish thatched cottage in Meenadiff, which is very close to Glencolmcille. Great walking routes and the absolute peace and quiet of the rich countryside. The Cottage sleeps 6 and is available all year round. Roarty’s Pub also has rooms for rent and of course, it’s a great traditional pub with some wonderful local musicians and traditional music nights. If you are looking for great accommodations on the Wild Atlantic Way (and believe me the selection is incredible) check out Booking.com and their huge variety of places to stay. Oh and by the way Teach means home or cottage in Irish gaelic. So there you have it all the reasons why you need to visit Glencolmcille. Have you been yet?